This story appeared today in Fermilab Today. 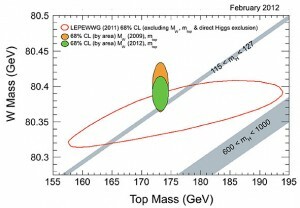 The new CDF result for the W boson mass, combined with the world's best value for the top quark mass, restricts the Higgs mass to the green area, requiring it to be less than 145 GeV/c2. Direct searches have narrowed the allowed Higgs mass range to 115-127 GeV/c2. Just as firemen use different methods to narrow the location of a person trapped in a building, scientists employ two techniques to find the hiding place of the theorized Higgs particle: direct searches for Higgs interactions and precision measurements of other particles and forces. Today, scientists from the CDF collaboration have unveiled the world's most precise measurement of the W boson mass, based on data gathered at the Tevatron accelerator. The precision of this measurement surpasses all previous measurements combined and restricts the space in which the Higgs particle should reside according to the Standard Model, the theoretical framework that describes all known subatomic particles and forces. The result comes at a pivotal time, just a couple of weeks before physicists from experiments at the Tevatron and the Large Hadron Collider in CERN plan to present their latest direct-search results in the hunt for the Higgs at the annual conference on Electroweak Interactions and Unified Theories known as Rencontres de Moriond in Italy. CDF collaborators have measured the mass of the W boson with a precision of 0.02 percent and found the particle's mass to be 80387 +/- 19 MeV/c2. They measured the particle's mass in six different ways, which all match and combine to produce the final result. CDF collaborator and Duke University Professor Ashutosh Kotwal will present the details of the measurement at a special seminar at Fermilab today at 10 a.m., and additional information will be posted after the seminar on the CDF website. Direct Higgs search limits established by the LEP experiments many years ago require the Higgs boson to be heavier than 114 GeV/c2. The new W mass measurement and the latest precision determination of the mass of the top quark from Fermilab triangulate the location of the Higgs particle and restrict its mass to less than 145 GeV/c2. This is in excellent agreement with the latest direct searches at the LHC, which constrain the Higgs mass to less than 127 GeV/c2, and direct-search limits from the Tevatron, which point to a Higgs mass of less than 156 GeV/c2. "The result couldn't align more with the direct Higgs search results than this," said CDF co-spokesman Rob Roser. "It indicates that if the Higgs boson exists, it should be right where we are looking." The DZero collaboration at the Tevatron expects to release its updated W mass result in the next couple of weeks. The Higgs boson is the last undiscovered component of the Standard Model and theorized to give fundamental particles mass. The upcoming results for the Higgs hunt combined with this new measurement of the W boson mass will provide the strongest test yet of the accuracy of the Standard Model. If experimenters at the Tevatron and LHC didn't find the Higgs where the W boson mass implies it should be, it would suggest our understanding of nature as embodied in the Standard Model is wrong. It would imply the existence of other undiscovered particles or of undiscovered forces that govern how matter behaves. "This is one of the most important precision measurements of the Tevatron because it serves as a stress test for the Standard Model - all sort of new physics models might in principle show up in the W mass measurement," said CDF co-spokesman Giovanni Punzi. The CDF and DZero results for the W mass likely will be one of the long-lasting scientific legacies of the Tevatron.